Please note that I am not a wedding-planning girl. I've always focused on what marriage I've wanted, never any details about a future wedding. I also know that 85% of marriages under the age of 25 will be divorced. 56% is the overall divorce rate. So, even though these are all facts, I have to say that I rooted for the couple in the book... mainly because the guy seems so perfect. What book? I Now Pronounce You Someone Else by Erin McCahan. 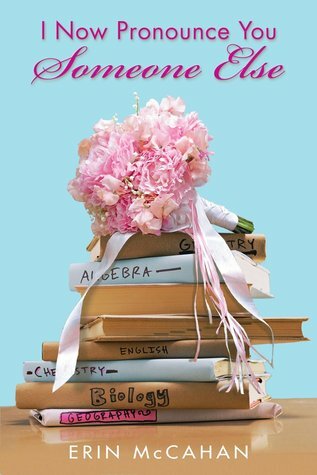 Summary (thanks, Goodreads): "Here Comes the Bride  If She Can Pass Chemistry. Eighteen-year-old Bronwen Oliver has a secret: She's really Phoebe, the lost daughter of the loving Lilywhite family. That's the only way to explain her image-obsessed mother; a kind but distant stepfather; and a brother with a small personality complex. Bronwen knows she must have been switched at birth, and she can't wait to get away from her "family" for good. Then she meets Jared Sondervan. He's sweet, funny, everything she wants  and he has the family Bronwen has always wanted too. She falls head over heels in love, and when he proposes marriage, she joyfully accepts. But is Jared truly what she needs? And if he's not, she has to ask: What would Phoebe Lilywhite do?" Bronwen's enthusiasm and background make you just love her, and you want to fight for and with her in this novel. You do with every single character in the novel. Every feels familiar, but they also have depths and secrets, so character development (and world development, for that matter) is just great. The lessons you learn about love and marriage are even more so. In Conclusion: Teens should read this, for sure. Every chica should, really.